When you're in the mood to go fast look no further than these eight games. They'll have you speeding down the road at absurd speeds, all the while going through some seriously populated areas. So buckle up as you drive recklessly through other cars and maybe a bystander or two. 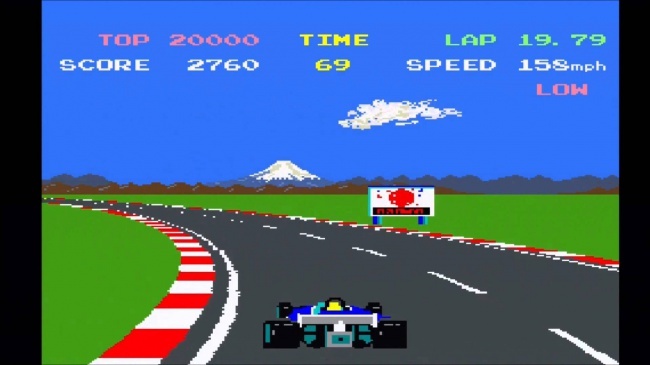 Pole Position came out in 1982 and blew everyone away. It was perfect for the time, the graphics were simple, but isn't that the problem with newer racing games, where they spend so much time making the cars look great, but then they have horribly rendered people in the stands. Just work with what you've got, and focus on the cars and leave the audiences alone, they aren't why we're playing the game. When you get a shot of the audience watching the race you're transported back to what they would have looked like if Pole Position had included people on the sidelines.